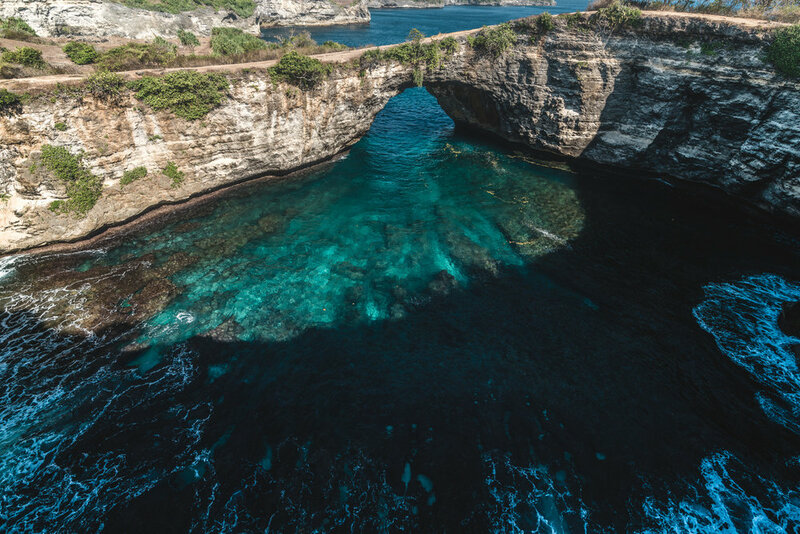 Nusa Penida, also knows as the Instagram Mecca of the 21st century. Boosted by the power of social media this particular little island became one of the most popular travel destination in the world. 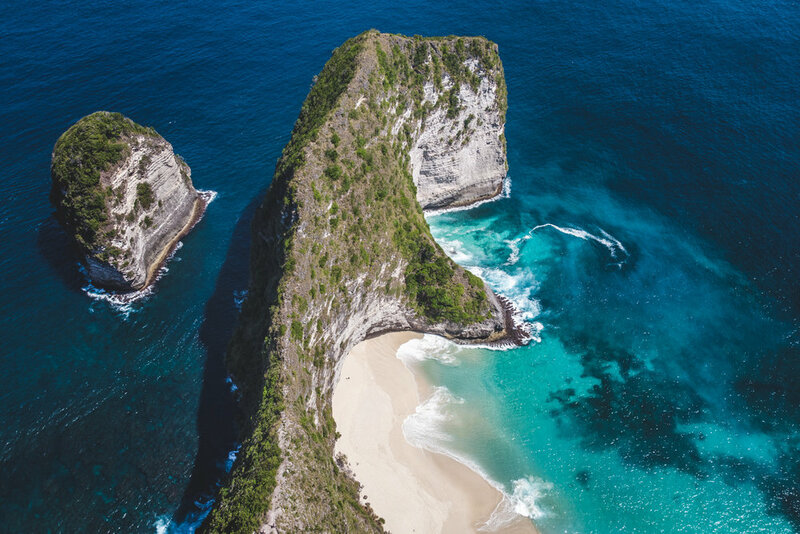 Nusa Penida features some of the most spectacular beaches and viewpoints in Indonesia and it's just one hour off the shore of Bali. We started our trip from Bali early (check out the blog post here). The ferry operates quite frequently between Sanur Harbor and Nusa Penida. There're usually no jetties and you have to carry your luggage through the shallow water into the boat. First stop on our tour through the island was the famous Kelingking Beach. The iconic rock and chalk-stone formation has attracted millions of people and definitely doesn't lack in beauty. There's a path on the ridge of the cliff all the way down to the beach, sadly we didn't have enough time. Little fun-fact, the little piece of land you can see in the pictures is also called drone graveyard by the locals. Apparently when you fly too low off shore you hit a radio dead-spot. Nevertheless, we flew our drone and it was fine, but keep that in mind. Next stop was Broken Beach at the western side of the island. 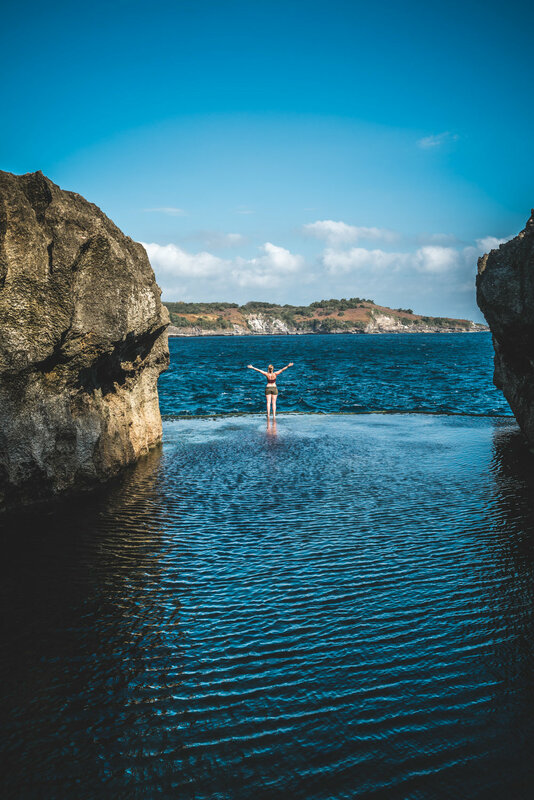 It's a natural pool connected to the ocean by an arch in the cliffs. The water is blue and quite famous for the large populations of manta rays. You can walk around the pool and over the arch and enjoy the picturesque views over the azure ocean. Not far from Broken Beach is Angles Billabong. It's another very shallow natural pool. It's exactly facing west so great sport for sunsets. Cliffs are pretty sharp so be carful when climbing down into the water. Our final stop for the day was Crystal Bay. Since we were staying on Nusa Penida for the night we weren't in a rush to get on the last ferry. Hence the beach was relatively empty. We went out for a quick swim just on time to enjoy the sun setting behind the cliffs. Also for more frequent updates please follow us on Twitter and Instagram.